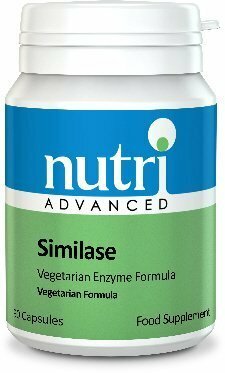 Nutri Advanced Similase Capsules, 90-Count. Similase is an exceptionally well tolerated plant-based enzyme formula designed to give broad-spectrum digestion support. Similase contains 8 digestive enzymes, including amylase, lipase and protease. Similase is suitable for a wide range of individuals including young children and the elderly, as well as those with very sensitive digestion. Enzymes are necessary for the breakdown of large molecule macronutrients (proteins, carbohydrates and fats) into small molecules which can then be absorbed. The broad range of enzymes in Similase may assist the breakdown of proteins, carbohydrates, fats, fibres and sugars in the stomach and/or the small intestine, before they are absorbed and continue their work. Similase is a reliably effective formula and is stable across a wide range of pH conditions, ranging from pH2 all the way through to pH12. This means it will work through the acidic environment of the stomach, right through to the alkaline environment of the small intestine. Did you know that phytates and cellulose, which are found in many foods, can bind to essential minerals and other nutrients, preventing their absorption? Similase contains the enzymes phytase and cellulase to help break down phytates and cellulose. Similase is derived from natural sources and is an excellent choice for vegetatrians. It is also suitable for those with lactose intolerance, but not for those with a true dairy allergy. Its not recommended for anyone with gastritis or ulcers. Easy to take, swallow 1-2 capsules at the beginning of each meal, up to 3 times a day.